My 2013 syllabus: 2013 Neil Bendle 4573 Measurable Marketing Syllabus. Teachers please contact me for more up to date material if you are planning a course. 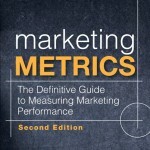 And for a technical note with our in-house online marketing expert Raymond Pirouz published by Ivey Publishing, Online Metrics: What Are You Measuring and Why? Does Acquisition Cost Reduce Customer Lifetime Value?